Slow network and Domain Mapping issue. That's just the top three, there are a lot of queries. Now if you don't have many blogs running...you don't notice the overhead but if you do...then it's a problem. 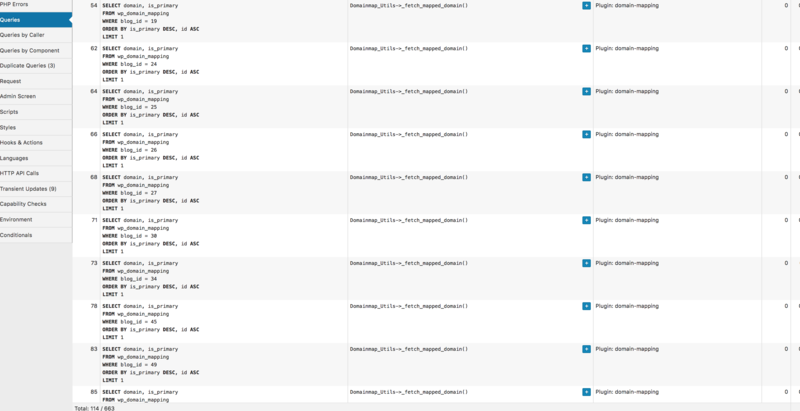 I think it shouldn't be querying the whole network of other blog domain mapping data on admin page loads. It's inefficient coding. Please check. I hope yo're doing fine today! The Domain Mapping has to perform some of these queries but there's a bit of "overhead" there, indeed. It's already been reported to our developers so I have added your ticket to that report as well to give them more information about it. Since that's on a plugin's "core level" and is strictly related to what it needs to actually provide features it's made for and to the way it works, it's quite complicated and might require significant changes in the code, maybe even some partial re-factoring. Make sure, please, that you're keeping the plugin up to date and keep an eye on this ticket in case our developers had any additional information or questions before a fixing update is released.